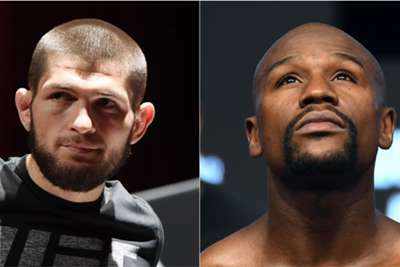 Khabib Nurmagomedov's proposed fight with Floyd Mayweather Jr may have taken a step closer to becoming reality after the UFC star held talks about a Moscow showdown. Earlier this month, MMA star Khabib outclassed Conor McGregor at UFC 229 to retain his lightweight title in a fight that was marred by an ugly fracas between the two camps following the bout. After that win, Khabib challenged unbeaten boxing legend Mayweather to a fight in a video alongside Leonard Ellerbe, the chief executive of Mayweather Promotions, at an event in Russia. Mayweather, who last fought in August 2017 against McGregor, later responded by saying "we're fighting" and Khabib has now discussed the possibility of hosting the fight in the Russian capital with general secretary of the Russian Boxing Federation Umar Kremlev. "A meeting with the Secretary General of the Russian Boxing Federation @umar_kremlev was held today," he posted on Instagram. "We discussed the fight with Mayweather. We want the fight to take place in Moscow at the legendary Luzhniki Arena. "They are sure that we will gather 100,000 spectators, and also set a world record for the sale of paid broadcasts. "And, most importantly, my father will be in the corner; a visa to Moscow is not needed."